Borges is a blind author, which sounds like a paradox. Surely he can't write and read without sight? Surely he must write in braille. Well, he never learned braille, he would dictate his writing to his amanuenses. Borges lost his eyesight when he was younger (but then, so did Milton and Joyce), a tragic predicament for such a learned and passionate reader. He had read thousands of thousands of book - indeed, when critics write about him, they always stress his reading. He read books that no-one read anymore, such as classics, medieval, Renaissance writing - you name it. His erudition was vast. But can we tell that when we look at him? Indeed we can. We can tell that beyond his blind eyes, his mind is buzzing with his learned erudition. His mind is buzzing with copious libraries, labyrinths, parallel corridors, roaming tigers, infinite universes and infinite libraries. We can tell this because he smiles and he is full of wonder. These images circle his mind again and again. He retains the same curiosity and imagination that he had as a child. The world for his is one continuum - the bird that he saw as an eight year old is still with him. Everything is a manifestation of the same Will. And, although he is old, he is the still the same young person that he once was. 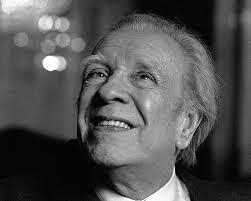 Everything is always for Borges.